June 13 2015. 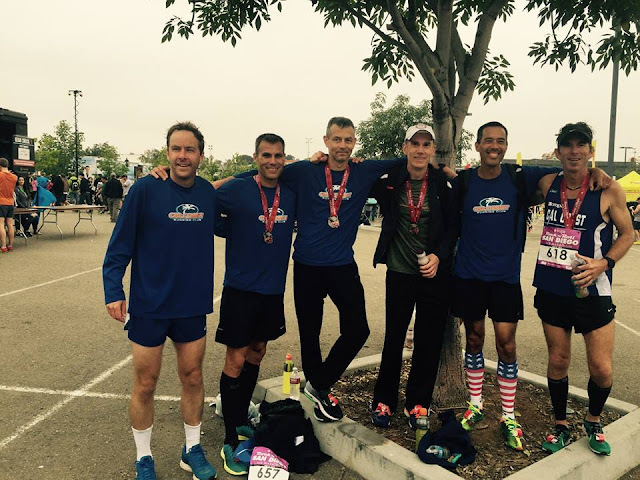 The skies were gray and temperatures in the mid 60's for the 2015 USATF Masters Half Marathon championships in San Diego on May 31 2015. 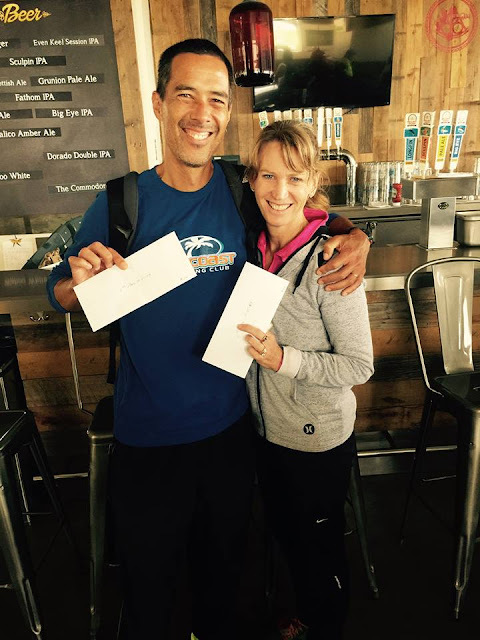 The race was contested as a portion of the Suja Rock N Roll San Diego Half Marathon. The sky may have been overcast but the performances were anything but gray. The headliners lived up to their billing and there were a number of other remarkable performances and races as well. San Diego's favorite son, Meb Keflezighi, very nearly took the Open title, just losing out in the final sprint, and what a time--1:02:29! This half marathon does not qualify for a record as it drops too much over the last 5K. But officials had timing mats and cameras out at the 15K and 10 mile marks in case any records were set. With an overall 2nd place finish, it is not surprising that Meb came through with new American Masters Records for the 15K and the 10 mile run. His splits were 44:23 at the 15K and 47:39 at the 10 mile mark. Both wipe out the existing American records of the remarkable distance runner, Kevin Castille [Lafayette LA]. Meb lowered the 15K mark by over half a minute and the 10 mile mark by more than a minute. Castille was also in this Masters race and finished 2nd, about two minutes back of Keflezighi in 1:04:50. Former Team USA Cross Country runner, Clint Wells [Boulder CO], was the third masters runner in with a time of 1:07:14. The great masters runner from the Cal Coast Track Club, John Gardiner [Rancho Santa Margarita CA], finished just off the USATF Masters podium in 4th with a 1:10:09. On the women's side it was all Jen Rhines [Boston MA] who was aiming for victory not records. And she got what she aimed at with a very strong win. She finished 8th overall in 1:16:36 and was the first Masters woman finisher by nearly five minutes. Celestine Arambulo [San Diego CA] came out of the F45 group to claim second place with a sterling 1:21:27. Maureen Wrenn [Boulder CO], the great Masters runner for the Boulder Mountain warriors was the third Masters finisher in 1:21:55. Wrenn held the lead for 2nd place at the 5K by 4 seconds but Arambulo surged and reversed that to lead Wrenn by 8 seconds at the 10K, and built her lead steadily from there for the 2nd place finish. There were top performances in many of the age group contests as well. 40-44. Meb made it clear right from the first 5K that he had his mind on an overall victory and nothing less. And although that eluded him at the very end of the overall contest, it did not prevent him from claiming the 2015 Masters Championship for the USATF Half Marathon. Castille was not going to let him have it easy though as he clipped through the first 5K in 15:28. But Castille found himself 43 seconds behind despite that burst of 5K speed. That did establish Castille as the top Masters runner to beat behind Keflezighi though. Wells crossed the 5K timing mat in 16:03, 35 seconds back from Castille. And Gardiner was 47 seconds further back. So unless someone had a killer kick it looked like the die was cast. And indeed that was the case as these four runners all maintained a pretty steady pace. Keflezighi gradually built his lead to 2:19, running the last 5K in 14:46; Meb maintained a 4:46 pace per mile for the entire race. Castille brught home his last 5K in 15:07 to conclude with an average pace of 4:57 per mile. That's some running--hard to believe it was the 2nd place effort! Wells ran strong but could not match the blistering sub-5 minute pace set by Keflezighi and Castille, coming home 2 and a half minutes after Castille off of a 5:08 pace per mile. 45-49. This age group totally baffled me. In part that was because Chris Knorzer, the favorite on paper, was a scratch from the race. And the other runners I picked as contenders were not up to the splendid pacing offered by the podium group. Christian Cushing-Murray [Santa Ana CA] amazed me and perhaps everyone else. Who would have thought this great 5K to 10K specialist would have the staying power to run the half marathon he did. In the Tour de France cycling race, they typically honor one of the cyclists with the title, "The Most Aggressive Rider of the Day", which designates the driver who attacked the course most consistently on a given day. If we had that in Masters Road Running, I would award that to Cushing-Murray for this day. He went out in 17:12 to establish a 40 second lead over his closest competitor, teammate Jerome Vermeulen [Simi Valley CA]. He then threw down a 16:50 for the second 5K-amazing! And although he finally eased up to a 17:31 in the third 5K, he was still building his lead-which was over 2 minutes at that point, and the lead remained above 2 minutes at the ten mile mark. The final 5K was the challenge as C-M's earlier killer pace finally took its toll. Vermeulen no doubt saw Cushing-Murray coming back to him and must have wondered if there was enough race course left to catch him. In the end Cushing-Murray gritted out a tremendous win; even though he lost a minute of his lead, he still was able to claim the victory in 1:13:55 to Vermeulen's sterling 2nd place effort of 1:14:53. Vermeulen ran a very steady pace for the first 15K (17:53, 17:49, 17:59) and then came in with a 17:14 final 5K--not enough to catch the leader but enough to guarantee him a strong 2nd place finish. Paul Kramer [Phoenix CA], meanwhile, was the best of the rest with a 1:18:01 performance, a sub-6 minute per mile pace for the race. 50-54. This group featured a rematch between Spyros Barres [Mystic CT] and Ricardo Maldonado [Scottsdale AZ] who battled for 1st and second in the age group competition at the USATF Marathon Championship last year in the Twin Cities. Barres is the defending champion and Maldonado has already run two marathons this year and a couple of half marathons. According to conventional wisdom to marathons in a single year is about the limit and usually that would be a spring marathon and a fall marathon rather than two in the spring. In any case, whether there was any fatigue for Maldonado or not, Barres went out strong in 17:53 and was never really headed. The second 5K really settled the race as Barres built his lead to 41 seconds. Maldonado's long distance strength showed itself over the last 7 miles as he cut into Barres lead, dropping it to 24 seconds at 15K and only 11 seconds at the 10 mile mark. But that was the end of the charge as Barres had saved enough for a strong 17:05 last 5K. Barres took the title in 1:14:55 with Maldonado 37 seconds back in 1:15:32. There was, at the same time, a terrific battle for the final podium spot between Jeff Creighton [Encenitas CA] and Kevin Zimmer [Del Mar CA]. Creighton went out strong in 18:10, 17:58, 18:30 to build a 38 second lead over Zimmer in 54:38 to 55:16. Zimmer then threw in a cracking sub-18 final 5K that was almost enough to catch Creighton. But Creighton was up to the task holding Zimmer off by 4 seconds at the finish, 1:17:12 to 1:17:16. 55-59. The Men’s 55-59 group also provided two exciting contests. Masters Runner of the Year in 2013, Brian Pilcher [Ross CA] took the group out in 17:36-Wow! Fred Zalokar [Reno NV], age 55, was laying 11 seconds off the pace and wondering, no doubt how that 58 year old up ahead was doing it. Pilcher continued to build his lead over the second 5K with 17:50 that gave him a 27 second lead over Zalokar. Zalokar realized he had to start reeling Pilcher in to have a chance. By the 15K mark, the lead was down to 19 seconds as Pilcher came past the 15K line in 53:41. By the ten mile mark, Zalokar had cut it down to 12 seconds. Over the final 5K, Zalokar unleashed a 17:29 that Pilcher could not match. In the end the victory went to Zalokar in 1:15:32 to Pilcher's 1:15:57. The race for the third podium spot was even tighter as the 58 year old veteran from the midwest, Thomas Dever [Terre Haute IN] challenged hometown favorite Adam Weiner [San Diego CA]. They were locked at the 5K with Dever a step or two ahead (18:10 to 18:12), and at the 10K (36:11 to 36:12). They were racing side by side at the 15K (54:41) and at the 10 mile marker (58:47). As is usually the case, the younger legs were fresher as the 55 year old Weiner was able to bring home a sub-18 last 5K to dash Dever's hopes. But hat's off to both runners for a terrific show. Weiner takes 3rd in 1:16:44 while Dever gets 4th in 1:17:12. 60-64. Charles Locke [Magalia CA] took the M60 crown in 1:34:22 [1:34:15], followed by Steven Segien [Collieville TX] in 1:35:06 [1:33:22], and Stan Ideker [San Diego CA] 1:37:13 [1:35:22]. Apparently Segien and Ideker did not realize that, as contenders for the age group championship, they should have lined up to start closer to the front of the race. Although Segien ran a minute faster, the rules of the race say that the championship is based on gun time, not net time. Locke crossed the finish line 1:34:22 after the gun sounded and Segien crossed 44 seconds later, probably unaware that he had the fastest net time in the group. 65-69. As with the group above, the winner did not have the fastest net time. Doug Wood [Sylvan Beach NY] started toward the front of the pack, a few rows behind the frontrunners; this is the norm for contenders in the M65 race. Local runner, Hank Sullivan San Diego CA], lined up quite a bit further back so it was over a minute and a half after the gun went off before he crossed the starting line. Perhaps Sullivan did not expect to be contending for a top spot. But, as with the 60-64 group above, a number of the usual contenders were not entered for a variety of reasons.Wood led the 65-69 group for the early portions of the race. Although Sullivan was probably unaware of Wood's position until late in the race, he made steady progress, gaining 13 seconds in the first 5K, 23 seconds in the third 5K, and by the 15K mark, had gained 34 seconds on Wood. In the next 0.7 miles he gained another ten seconds so that at the ten mile mark, he was only about a minute back and starting to close swiftly. It would be interesting to know at what point Sullivan was aware of Wood wearing the M65 on his back up ahead--2 miles to go? 1 mile to go? In any case, Sullivan had his sights on Wood and was drawing ever closer as they were approaching the finish line. It appears that Sullivan pulled even with Wood before he realized he was about to be overtaken and reached down to find another gear. The final results show a mere second in gun time between them. Wood held Sullivan off with a gun time of 1:34:26 to Sullivan's 1:34:27.[1:32:43]. 70-74. Jan Frisby took his fourth Masters national championship in as many races this year, adding the Half Marathon crown to the 8K and 10K road championships, and the 8k USA Cross Country Championship. Frisby decided to take on the Half Marathon race even though it did not fit well into his personal plans. As a result, he had not prepped as he usually would for a lengthy race. Nonetheless he ran a very respectable time, 1:35:41. 75-79. Richard Williams took the 75-79 title in 2:13:02 [2:11:19]. 80-84. Richard Burch [San Diego CA], age 80, was the oldest runner in the Championship and took the gold medal in the 80-84 group in 2:30:42 [2:28:54]. 40-44. Jen Rhines, no doubt, had her sights mainly on open prize money but was happy, I am sure, to also take home the Masters crowns for overall and women's 40-44 age group in 1:16:36. Although several minutes behind Rhines, Maureen Wrenn came in nearly two minutes ahead of her closest pursuers, Sharon Lemberger [Menlo Park CA] and Carla McAlister [San Clemente CA]. Wrenn showed that she has the staying power for longer races like the half marathon. Lemberger and McAlister had quite a see-saw battle for the finbal podium spot. Lemberger covered the first 5K in 19:56 and followed that with a 19:44 to race past the 10K marker in 39:40, with a 13 second lead over McAlister. But then McAlister made her move, running the third 5K in 19:54 to pass the 15K marker three seconds ahead of Lemberger in 59:49. It looked like there would be no stopping McAlister as she raced past the 10 mile mark in 1:04:09 with a 12 second margin over Lemberger. But Lemberger had saved the best for last. Even though McAlister had enough in the tank for a 19:37 final 5K, she could not hold off Lemberger who cranked out a 19:16 over the final 5K to claim the third spot in the podium by 8 seconds, 1:23:42 to McAlister's 1:23:50. 45-49. I had this race picked as a contest between Jaymee Marty [Sacramento CA], defending champion,Terri Rejimbal [Tampa FL] and a local favorite, Celestine Arambulo [San Diego CA] and that was exactly correct, but I had the order reversed. In the event, Arambulo and Rejimbal took off together to cross the 5K marker in 19:17 and 19:18 respectively, with Marty a bit further back in 20:08. From there Arambulo steadily built a lead over Rejimbal that grew to 14 seconds at the 10K, 34 seconds at the 15K, and a minute and 7 seconds at the close in 1:21:27. Although not able to stay with Arambulo, Rejimbal justified the cross country trip by running a fine half marathon, finishing a strong 2nd in 1:22:34. Marty took third in 1:23:55. 50-54. I referred to Kathleen Cushing-Murray, in my preview as 'something of a wild card' and how right I was. Just like her husband, Christian, in the M45 group, Cushing-Murray who is known as a strong 5K to 10K runner, showed she has the staying power to race well at this distance. Whether because she was worried about going out too fast or for some other reason, Cushing-Murray started many rows back and did not cross the starting line until more than a minute after the starting gun sounded. But she made up that deficit on her two competitors, Becky Burnett [Farmington UT] and Amy Rappaport [Califon NJ], in the first 5K. After that it was just a question of steadily extending her lead. She crossed the finish line in 1:31:37 [1:30:24], two and a half minutes ahead of Burnett. Burnett took second in 1:34:04, followed by Rappaport in 1:36:15. 55-59. I viewed this as, potentially, a tight race between Nancy Hatfield (McCall ID) and Meredith Mills. Unfortunately Mills was a scratch so Hatfield had no close competitor. She took first in 1:41:46 [1:40.05]. Tina Breen [Spring Valley CA] took 2nd in 2:06:03 [2:04:15]. 60-64. It looked like this should be a tight contest between Honor Fetherston [Los Gatos CA], Marina Jones and Janet Cain [Sonoma CA]. But Jones did not run and Cain was not at the top of her game. Fetherston ran a strong race to win by more than 20 minutes and add this first place medal to the medal she took at Brea in the 8K, finishing second behind the record setter, Chris Kennedy. Fetherston's time was 1:32:03, just about 7 minutes per mile-pretty fancy running for this group. Cain took 2nd in 1:55:04 [1:53:10]. Donna Chan [San Diego CA] took 3rd in 2:32:06 [2:30:24]. 65-69. This age group race unfolded just as expected. Jo Anne Rowland [Concord CA] took first place in 1:46:42 to add this gold medal to the one she took in Brea CA in the 8K. 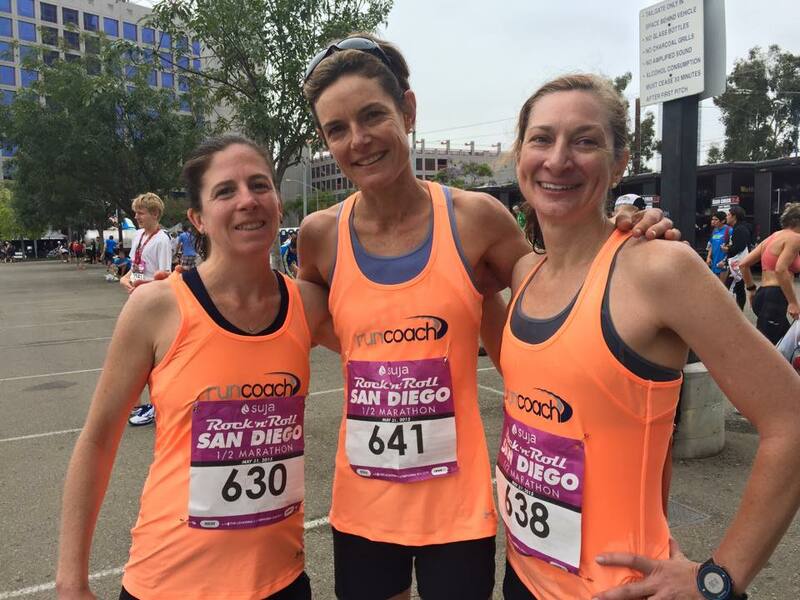 Sharon Chaix [San Diego CA] finished 2nd in 2:11:31 [2:09:43] and Jane Williams [Coronado CA] claimed the final podium position with a 2:19:53 [2:18:10]. 70-74. Norma Thomas [Moreno Valley CA] did not disappoint as she took her 2nd national championship of the year in 2:01:33. Carol Turner [Newark CA] took 2nd in 2:32:29 [2:32:22]. Age-Grading. My top contenders for the ten age-gading awards were Keflezighi, Rhines, Castille, Pilcher, Maldonado, Weiner, Wells, Dever, Barres, Frisby with Marina Jones (scratch) and Fetherston as two others who might break into the top ten. Seven of my top 10 made the final list with one of my outside contenders making it. The bigger surprises were Zalokar and Sheeran although they could easily have been included on the list of potential contenders. The results were somewhat unusual in that two male runners in their early 40's took the top two spots and there was only one woman in the top ten age grading scorers. Typically one sees 1 or 2 women in the top 5. Also noteworthy is that the M55 age group had half of the top ten age-grading scorers. Note: Age-grading is the statistical process that adjusts actual times to scores on a 100 % point scale in terms of the best times run by an athlete of that age and gender. TEAMS. Teams were included as part of the Half Marathon competition for the first time this year. As it was also a switch in venues from Florida to California, only a limited number of teams competed. W40+. The California running club, TeamRunCoach, successfully repelled their Utah competitors, Wasatch Athletics. Comprised of Sharon Lemberger [Menlo Park], Samantha Forde [Santa Cruz] and Ashley Gross [Menlo Park], TeamRunCoach scored an easy victory with a combined time of 4:25:28 [average = 1:28:27]. The Wasatch Athletic team ran a fine race for 2nd place, finishing in 4:37:21 [average = 1:32:27]. W60+. The home grown Impala Racing team of JoAnne Rowland [Concord CA], Janet Cain [Sonoma CA], and Donna Chan [San Diego CA] took the title unopposed in a time of 6:13:52 [average = 2:04:37]. M40+. The celebrated Cal Coast Track Club team from Southern California scored a dominant win in this competition. The team, consisting of John Gardiner [Rancho San Margarita CA], Cristian Cushing-Murray [Santa Ana CA], Jerome Vermeulen [Simi Valley CA], Rob Arsenault [Riverside CA], and Jonathan May [Costa Mesa CA], ran a combined 3:38:57 [average=1:12:59]--that's cookin! The two other teams in the race, the Prado Racing Team and the Phoenix Free Soles, had quite a battle for 2nd place. Stephen Johnson [San Diego CA] started it off for Prado with a 1:13:15. But then the Phoenix Free Soles countered with Ricardo Maldonado [Scottsdale AZ] in 1:15:32 and Brett Bernacchi [Phoenix AZ] in 1:16:32. When Prado's 2nd runner, Jeff Creighton [Encenitas CA] came in at 1:17:12, that gave the Prado team a total of 2:30:27 to Phoenix's 2:32:04. If Phoenix could get their 3rd runner in a minute and a half or so before Prado's 3rd runner, they could take the 2nd place medal away from them. But it was not to be, the 3rd runners for Prado and Phoenix came in within 13 seconds of each other. Prado's Jason Lewis [Carlsbad CA] brought it home in 1:19:13 while Phoenix's Jeff Turner [Phoenix AZ] finished the scoring with a 1:19:26. That left Prado Racing with a comfortable margin of over 4 minutes and the silver medal, in 3:49:40 [average = 1:16:33]. Phoenix happily took the bronze medal as a reward for their outstanding 3:53:59 [average = 1:18] performance. M50+. The Cal Coast Track Club was unopposed as the team of David Olds [Los Angeles CA], Thomas Schumann [Santa Monica CA], and Carey Baca [Costa Mesa CA] brought the gold medal home with a fine time of 4:14:48 [average = 1:24:56]. There were many fine performances. We look forward to an even better turnout next year and expect the enhanced competition to lead to more outstanding times and perhaps another 15K or 10 mile record or two.